The Celery Stalker and I were on a geocaching mission. Twenty caches in one day was the goal. The Long Beach neighborhood of Belmont Shore was the locale. From the very tip of the peninsula to a bit past the famed Belmont Plaza Pool, we wandered along Ocean Boulevard minding our coordinates and avoiding the muggles. But after finding only one out of our first four caches, we were losing steam and in need of some liquid nourishment. We decided to venture down 2nd Street, a street occupied by various Irish bars, trinket stores, mass retailers and even an ice cream filled cupcake shop. Spas and coffee shops dot the landscape, and restaurants serve everything from classic American comfort food to sweet and savory crepes to sushi and beyond. We were on the way to our next cache when two open barstools called our name. Simmzy's is a restaurant committed to “sourcing local, responsibly-grown, seasonal ingredients,” and also offers a ridiculous 31 rotating craft beer taps. Without a blink, we quickly saddled up to the bar. I, of course, am always on the job, so I ordered my bloody while the Stalker perused the extensive beer list. My drink arrived bacon garnished with a big leafy celery stalk, and my partner in crime promptly devoured the bacon while I took to the heart of my bloody. The very well salted glass housed a bright red mix, and my first sip delivered a rather distinctive hint of sweetness followed by a strong lingering horseradish flavor. Surprisingly though, it was only moderately spicy, perhaps a result of the sweetness cutting through the heat. The saltiness of the rim also did not overpower the rest of the drink, which allowed for a well-balanced, very drinkable, every day, any time of the day sort of bloody mary. And at $5.50 a pop, why not. Since our geocaching mission didn’t allow for too long of a pit stop, we were not able to partake in Simmzy’s brunch offerings. But I will say, from looking around, the plates of food looked absolutely delicious. 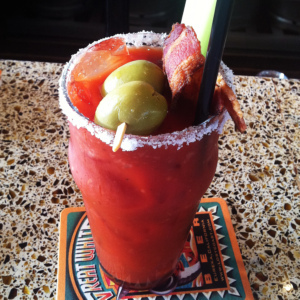 For their sweet, sweet bacon garnished bloody mary, Simmzy’s earns 3.5 Celery Stalks.